I made these with all the leftover pumpkin I had last fall. They were pretty delicious! 2. Beat the filling ingredients until smooth. 3. In a separate bowl, beat sugar, flour, baking powder, cinnamon, salt, and baking soda. 4. Beat in remaining batter ingredients until smooth. 5. 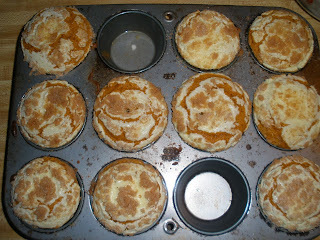 Fill paper muffin cups 1/2 - 2/3 way with batter. 6. Add about 1 Tbl. filling on top of batter--be careful to not let it touch the sides of the pan. 7. In another bowl, cut in butter with the topping ingredients; mix until even. 8. 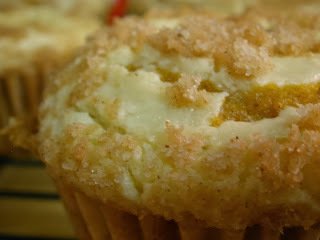 Sprinkle on top of muffins, bake for 20 minutes. Holy crap Rachel this sounds like heaven happened in a muffin. I will make these. Keep this up!! I love this. If I can cook maybe I can trick someone into marrying me one day.